Although most people experience minor irritation from mosquito bites, there are some who suffer from much severer symptoms that can become quite serious. Mosquitoes can transmit such diseases as yellow and dengue fevers, encephalitis, and malaria. The majority of mosquito bites happen either at dawn or dusk, which are the times of day that mosquitoes are the most active. Male mosquitoes don’t bite humans, preferring water and nectar. It is female mosquitoes that are on the lookout for human blood. Female mosquitoes find their human prey by relying on exhaled carbon dioxide, chemicals found in sweat and scent. After landing on an exposed area of the person’s skin, she imbeds her proboscis, and proceeds to draw blood. The reaction experienced by her victim, normally itching and a red bump, is caused by the body’s response to proteins found in the mosquito’s saliva rather than the bite itself. What Symptoms Will You Exhibit If You Have Mosquito Bite Allergy? Since a tolerance to the symptoms of mosquito bites increases the more a person is bitten, children usually experience more serious reactions than adults. 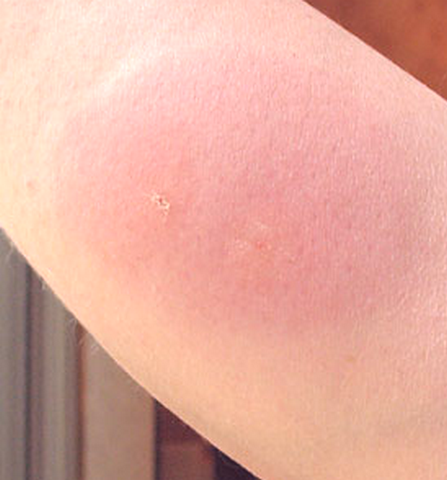 Mosquito bites generally cause pink or red itchy bumps which can be irritating for up to 48 hours. When a person has mosquito bite allergy, they may experience symptoms such as lesions, hives on the area of new and old bites, a large area of itching, and inflammation of the lymph system (lymphangitis). In severe cases, the person may suffer anaphylaxis, which is a rare, life threatening condition that causes wheezing and swelling of the throat which is a considered a medical emergency and requires immediate attention. In addition to allergic reactions, mosquito bites can transmit diseases like yellow and dengue fever or malaria, which are uncommon in Western countries. The West Nile virus can be transmitted by mosquitoes in North America. Indications that the symptoms are caused by something more serious than an allergic reaction may include: severe headache, body aches, fever, rash, fatigue, sensitivity to light, nausea, vomiting, neurological changes, confusion, or meningitis. If any of these symptoms or if an infection is spotted where the bite occurred, seek medical attention immediately. It is rare to develop symptoms of anaphylaxis after being bitten by a mosquito. It is treated by using mosquito whole-body extract in the form of an allergy shot. This treatment is very effective for those who are allergic to mosquito bites. If anaphylactic symptoms are experienced, emergency medical care should be sought as soon as possible. How Can You Prevent Mosquito Bite Allergy? Staying away from tall grassy fields, swamps, and other areas that are normally infested with mosquitoes. Treate standing water, such as a pool with chlorine. Empty standing water, such as in a bucket. Apply mosquito repellent, especially those that contain DEET. Wear long pants and sleeves to cover more skin. Use permethrin, an insecticide, on fabrics such as clothing and tents. Avoid or limit exercise and sweating when in areas that are infested with mosquitoes as they are drawn to warmer skin, carbon dioxide, and sweat.